The middle class in America is shrinking; numerically in terms of the percentage of the total population, as well as qualitatively in terms of the quality of life. Most of us consider ourselves to be members of the middle class, and we’re being squeezed by declining real income and rising expenses, as we increasingly shoulder the inflationary costs of corporate America, and the burdensome costs of government operations. 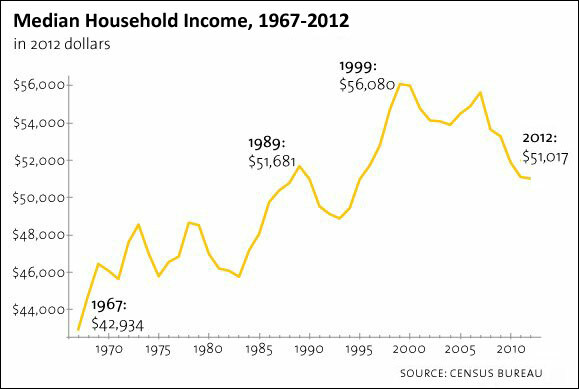 Consider the following middle class statistics as researched by Bill Moyers and PBS. Middle class is roughly defined as those households ranging in income from $25,500 to $76,500. At $51,017 the real median household income in 2012 is even less than it was at the end of the ’80s, and it’s down 9 percent from its high in 1999, with the biggest portion of that decline, 8.3%, in just the past five years. The median net worth of a family in 2010 was $77,300, compared to $126,400 just three years earlier. In 46 of our 50 states, the poverty rates have increased over the past five years, and the national poverty rate is over 15% for the fourth year running. The last time that happened was in 1965. More and more families are dropping from the ranks of the middle class into poverty. One of the greatest factors adversely affecting median household income is the loss of jobs and extended unemployment. According to the Bureau of Labor Statistics (BLS) the Participation Rate, which is represented as a ratio or a percentage of the total population, is at the lowest levels in 50 years, with about 62.8% of the population working. According to the BLS U-6 data, 13% of the population is still unemployed or underemployed, and marginally attached to the labor market. On the cost of goods and services the picture isn’t much better. The Consumer Price Index (CPI) is the most relied on figure for calculating the year over year inflation rate. 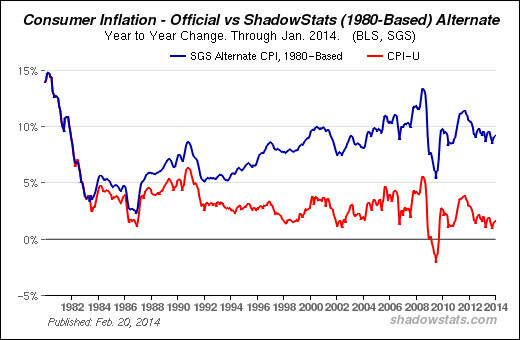 According to Forbes, the BLS has changed the way it calculates the CPI 20 times over the past 30 years, including new formulas and indices that have separated the volatile food and energy components and created a separate “Core” inflation rate. By some economist’s calculations, these changes have resulted in a significant dissociation between what the government reports as the inflation rate, and what we see in reality for the prices of goods and services that we buy. 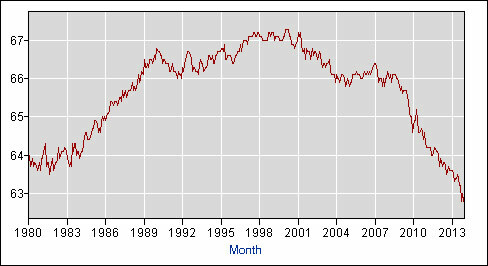 According to the BLS the CPI was up 1.6% last year, and has hovered between 1-4% over the past five years. But if the inflation rate were calculated now the same as it was in 1980, inflation over the past five years would’ve been between 5-12% per year. For example, average out-of-pocket healthcare costs have nearly doubled in just the last seven years, from $2,035 to $3,600. Domestic energy prices have likewise increased dramatically. Over the past 10 years, energy prices have more than doubled as government energy policy has become increasingly ideological and counterintuitive. Increasing energy costs adversely affect the middle class disproportionately. These data paint a distressing picture of the current status of the American middle class. And prospects for improvement are virtually nonexistent since the basis for the middle class demise is causally connected with the policies emanating from, and firmly entrenched, in the nation’s capital. What’s stifling job growth is the expansive overreach of government regulation. Last July, a U.S. Chamber of Commerce survey showed 74% of small businesses are positioning themselves to slash hours, lay off workers, or both because of increase regulation, primarily because of the Affordable Care Act. Investors Business Daily has a running list of nearly 300 large companies that are reducing hours for employees to get below the 32 hour threshold mandated by the Act. And that’s all from just one piece of legislation. The Committee on Oversight and Government Reform published research two years ago that illuminates the role government has played in suppressing job growth. The committee reported, “Many regulations and legislation – both existing and proposed — exacerbate the uncertainty created by today’s volatile economic environment. Virtually every new regulation has an impact on recovery, competitiveness, and job creation.” The president’s own Economic Advisory Panel came to the same conclusion, and reported, “regulations are harming businesses and job creation.” This panel went on to suggest several measures that could be implemented in order to quell the expansion of such job-destroying regulation. The best way for people to increase their station in life is with a good job. Ronald Reagan once called jobs the “best welfare program.” And the best way for good jobs to be created is with a healthy economy that is vibrant, growing, adapting, and adjusting to global and domestic market vicissitudes. And the best way for that to be facilitated is to get government out of the way of trying to micromanage nearly every component of the economy. If the private sector didn’t have to work around overreaching regulation and interference, market efficiencies in the private sector could unleash the creation of jobs, market synergies, and economic growth. The job situation will not improve appreciably until the cost of doing business starts dropping. Last year the Small Business Administration reported that regulation costs American business $1.75 trillion per year, and costs small businesses as much as $10,585 per employee. Just the costs of Obamacare, Financial Regulatory Reform, and new EPA regulations, are projected to increase that cost per employee as much as 30%, according to Investor’s Business Daily. In 2012, the President said, “This country doesn’t succeed when we only see the rich getting richer. We succeed when the middle class gets bigger. We grow our economy not from the top down, but from the middle out.” He was correct. But it’s time that our policies begin reflecting that stated priority. The history of mankind is littered with fallen nations and governments that overreached by centralized planning, stagnated their economies, and collapsed under the massive weight of their inefficiencies. Hopefully Bartlett and Steele are correct, that the utter collapse of the middle class is not inevitable. But for it not to be, a reversal of our current trend is critical, and the sooner the better. Succinctly stated, we have shrinking income, inflation in energy and food “skyrocketing,” as was predicted five years ago, a weaker dollar, a ballooning debt, and a national security-risking deficit. The costs of all these challenges are landing squarely on the back of the middle class. A strong middle class equals a strong America. We can’t have one without the other. And our current policies are killing both. Associated Press award winning columnist Richard Larsen is President of Larsen Financial, a brokerage and financial planning firm in Pocatello, Idaho and is a graduate of Idaho State University with degrees in Political Science and History and coursework completed toward a Master’s in Public Administration. He can be reached at rlarsenen @ cableone.net.